Neos Skopos, it's my village now! 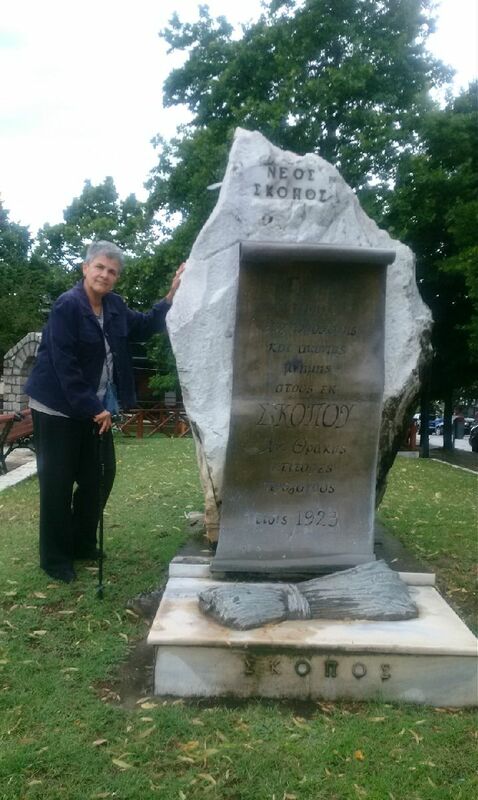 Spent yesterday -- thanks to my friend Soula Moraitou and her husband Takis -- looking for relatives of my father's father Xanthoulis Xanthopoulos in Neos Skopos (near Serres). 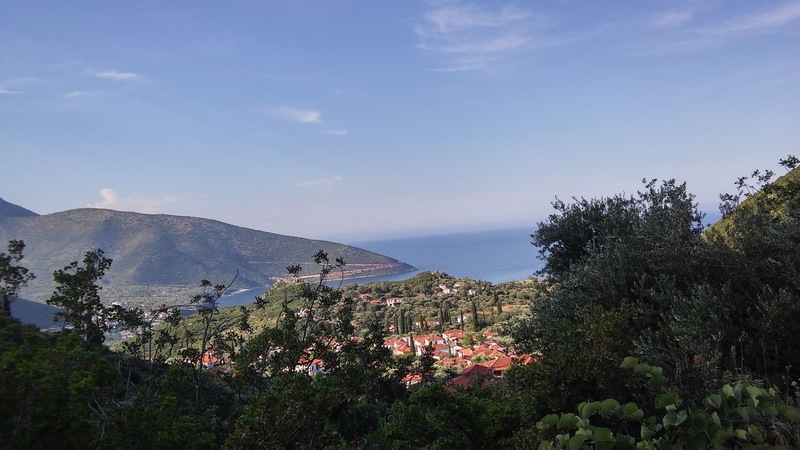 The town was built by refugees from the original Skopo in Turkey (Eastern Thrace), where Xanthoulis was born and from which Greeks were expelled in 1915 leading up to the exchange of populations in 1923. Residents and the two presidents of the village and of Orfeos (an amazing organization dedicated to preserving the Skopo legacy) could not have been nicer, even opening the Town Hall on a Sunday morning to search records. The village is patterned after the original, topped by a building complex -- funded by Skopians all over the world -- housing Orfeos and it's multiple activities: library/office, large practice‎ room with wooden floor for the dance troupe, an auditorium with theater seating, and photo gallery. Excursions to the original Skopos are now the norm -- and a beautiful book dedicated to the Skopo Diaspora was published to well-deserved fanfare on May 25th in Thessaloniki on the 100th anniversary of the 1915 pogroms. Unfortunately my short-on-details quest yielded zero results, so far. I had only my Papou's name and his father's (Efstathios) plus documentation of birth in Skopo -- and no idea when exactly he left Skopo, except that it was probably before 1915. 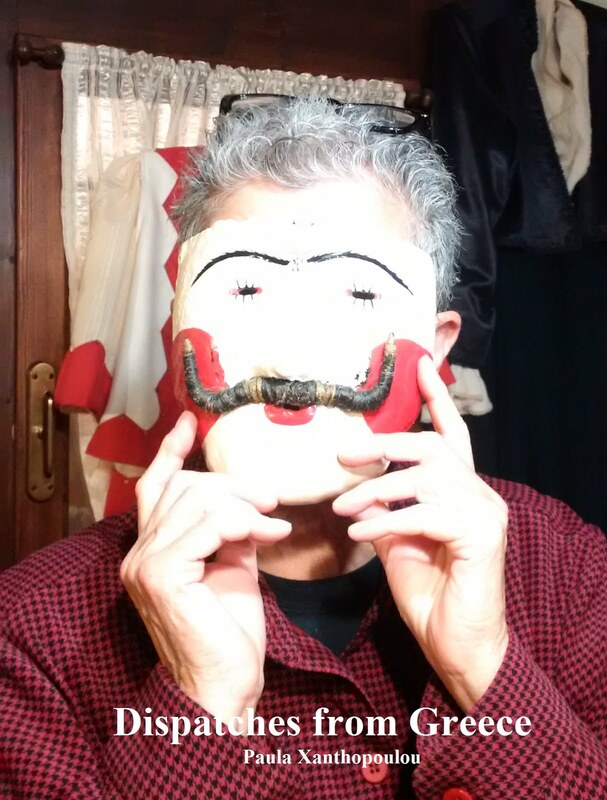 But Orfeos will publish a blurb about me and my search in their upcoming quarterly newspaper, officially taking me in to the Family of Skopians (as I see it). Their interest and generosity were overwhelming. Can't stop thinking about tomorrow! ‎ Happily ensconced now in the throw-back "Tourist Hotel" in Thessaloniki, on Mitropoleos Street just 2 blocks from Plateia Aristotelous. I miss my Aunt Soula, but NOT the Athens humidity. 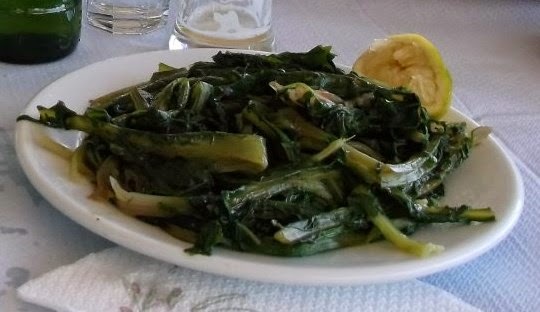 For dinner, I hobbled over to the Modiano Market area and enjoyed a glass of tsipouro and meze plate for 5 Euros. It's now 4 am and I cannot sleep. 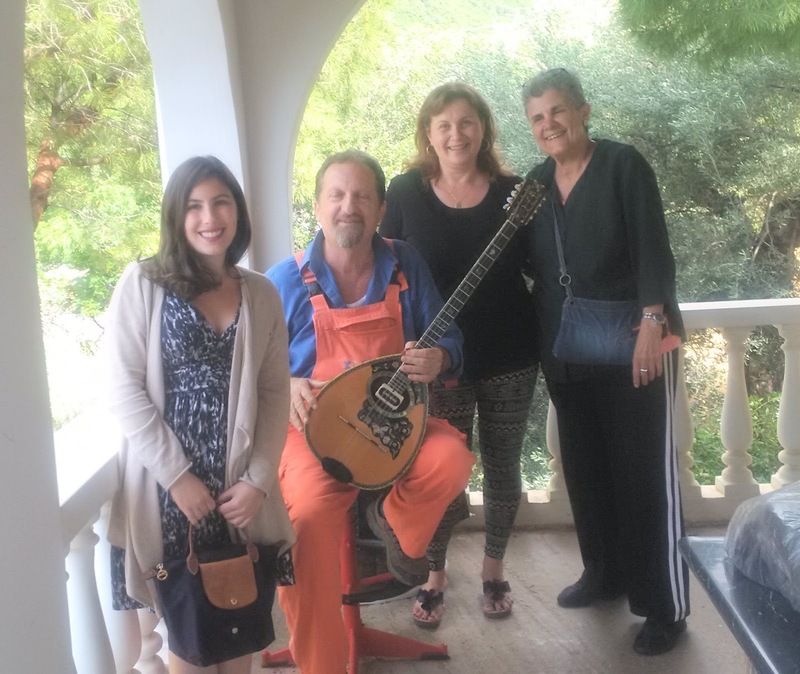 I got a ride from Athens to Thessaloniki with the daughter of a 1971 Girls School graduate, Eleftheria née Rangoussi '69, now living in Philadelphia. Kathy Varkadou was going to pick up her own daughter, a current AFS high school student -- 45 years since I recruited her mother to come to the School from the town of Giannitsa. 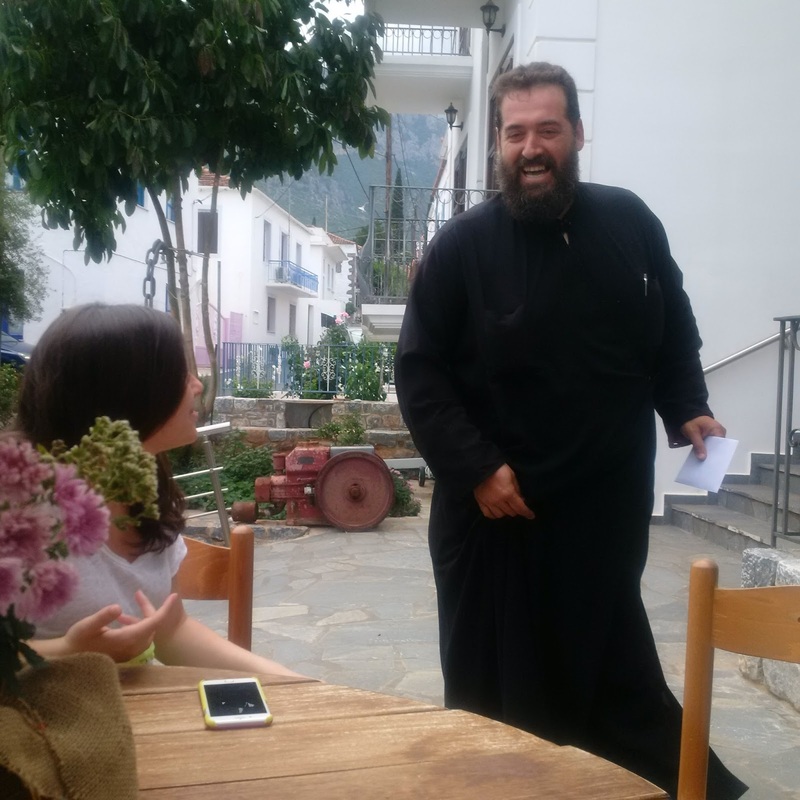 It was a timely opportunity to get to know that family better and acclimate myself to the current Greek reality. Kathy -- a registered nurse with 4 kids, and an impressive woman in her own right -- was born in the US and married in Athens 20 years ago. She said that her mother describes her experience at the School as the best years of her life. In a few hours, Kathy will show me around the place I left 37 years ago...and where once upon a time I used to give the tours.‎ Mind-boggling! But I am now actually looking forward to it. I would like to report good, clear-cut news about the political/economic situation here in Greece, but I cannot. The capital is awash in speculation and anxiety. People here simply cannot afford more cuts to their pensions or added taxes for necessities like food and utilities. Many people have put any even minimal summer plans on hold. The Finance Minister said that yesterday was a good day, because now the issues have been clarified, And polling shows that the Greek public doesn't want the government for change to back down. We will have some answers very soon. 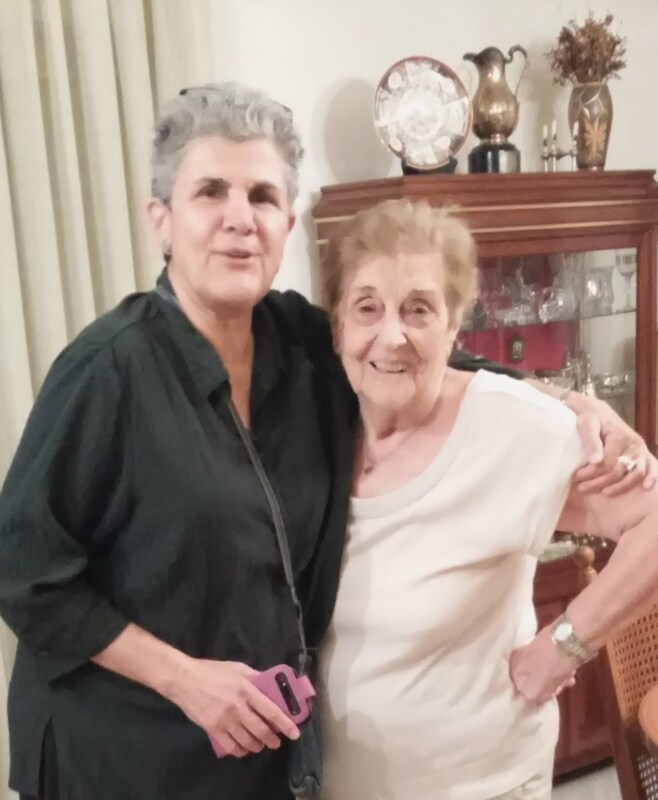 While in Athens I stayed with my dear Thea Soula in Palaion Faliron where I ate down-home cooking, watched the news, and talked about family history. Her father was the mayor of my father's hometown of Naousa during the Civil War and was assassinated by the communists guerrillas. 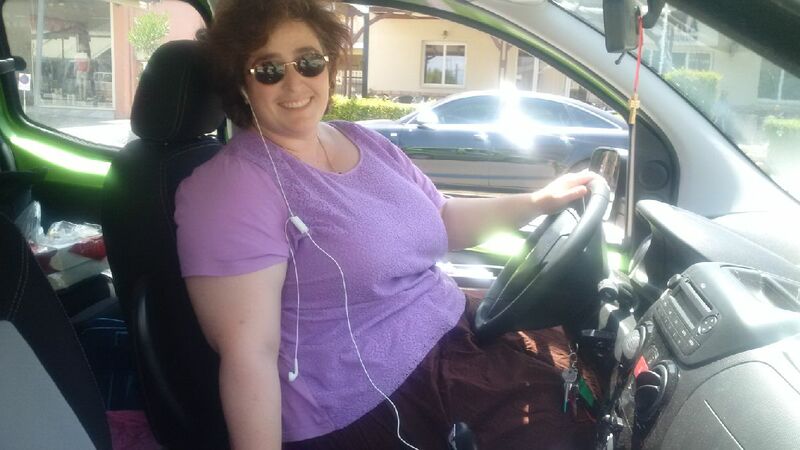 By that time Soula was safely in Athens and became a world traveler with her late husband Mario, even living in Salt Lake City where he went to school and where their daughter Leah was born. 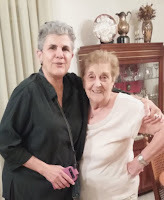 They came to our house in California many times -- and we had much to talk about, including who to visit when I go to Naousa next week to work on my maternal grandmother Paraskevouda Koutsouki's quarter of our Family Tree. This morning, my aunt was arguing with her television set. She is 86 and already her pension has been cut by 36 percent. Can you blame her? Leaving Kyparissi today, a lot more connected than when we came.. Speeding away from‎ Kyparissi towards Athens on the 6 am (and only) bus, I am trying to absorb everything that transpired on my 3rd trip to Papou George Sarris's village -- this time with my niece Rachel and good friend Wendy. Six days in this gorgeous, semi-isolated, and newly-favored spot by rock climbers were simply not enough. Next time, a month minimum! ‎My aim this trip was to gather info and meet Sarris cousins ...and to hook Rachel up with contacts/info so she could come back to her great-grandfather's village any time. Mission accomplished -- ‎ as we spent a lot of time with my penpal cousin Froso Heliotis (50 year-old granddaughter of Papou's brother Kostas) and her bouzouki-playing husband Kostas. And the Vasiliou clan that owns/runs the exellent Paraliako Hotel are indispensable! 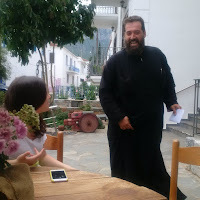 Many of my Family Tree questions were answered thanks to the village priest Haralambos Fessos and the other 10 or so people that I grilled relentlessly. 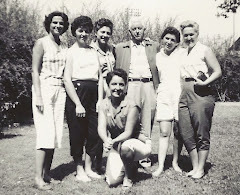 It‎ was fascinating to learn that local relatives did not have a complete list of Papou's siblings (8 total), now provided by me as patched together from various sources. Seems like the 3 that went to the States and never came back -- except for a visit by Sofia Sarris Demakopoulos -- we're off the radar, as were the 2 youngest who died in 1923 and 1933 according to church records. That list may now make it into Maria Ioanniou's second book on the area, this one more specifically about Kyparissi. Land records that Maria studied indicate that Ilias Sarris -- aka Louis, who sold his Crockett Sweet Shop to his brother George‎ -- built "To Milo tou Sarris" above the upper Vrisi portion of Kyparissi after he returned to Greece circa 1920. It was not handed down from his father Nicolaos, who died in 1922, followed 5 years later by his wife Angeliki. No one seemed to know where the Sarrises lived before 1920. But school records have George Sarris registering for 2nd grade in 1899, with his father's occupation listed as "tekton" (construction worker). Eleni Ianniou w/her sister's book! And from which part of the family tree did Vasiliki Sarris Xepolias (aka "Thea Vasilo" or Bella) come from? She and her family lived in Stockton approximately 1920-25. When her husband Panayioti died, they moved to the San Mateo area, and the children are now deceased -- including ‎Panayiota "Ioda" Manolis, who was close to the Demakopoulos/Mellis clan in Santa Cruz and known to many of us. Kyparisioti John Tsiglieris -- who I had encountered on the bus coming in per my last post -- promised to investigate further. There are many Xepoliases in or from Kyparissi. But as the circle widens, it seems to be closing at the same time. Just a few kilometers from Kyparissi, and I am freaking out! 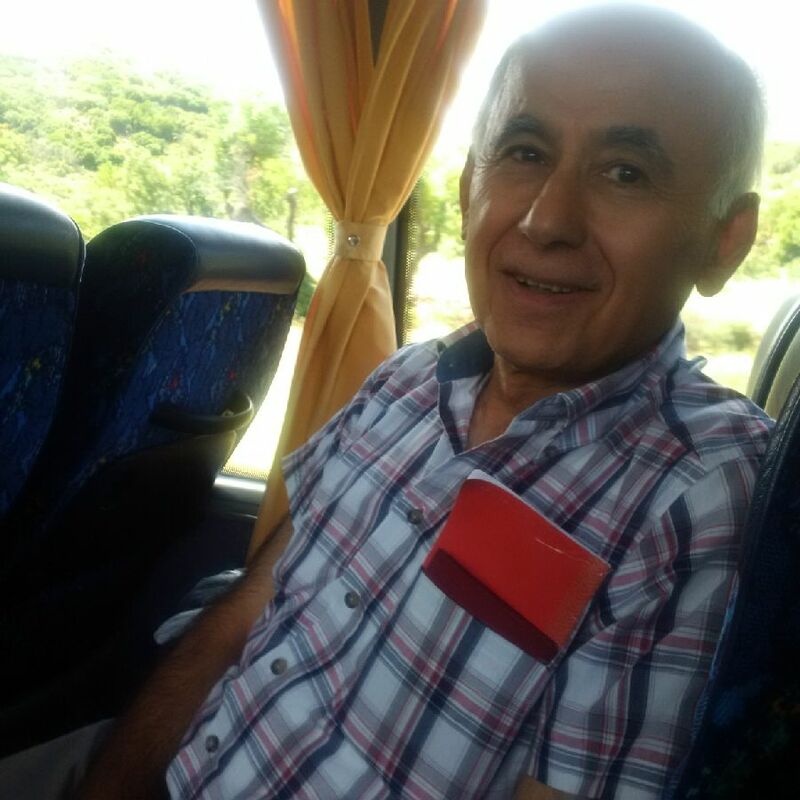 ‎Sitting on the bus to Kyparissi, Lakonias, I turned to ask another rider if he could tell the driver that we wanted to get out at the Paralia intersection. He said, "Where are you going?" I said to my grandfather George Sarris' village. What? He lived at one time in Tracy and went to St. Basil's Church. Did I know Nick Demas? My Uncle Nick, whose mother Sofia was my Papou's sister? Turns out that John Tsiglieris (see photo) lived in Tracy 1970 - 86. He and another Kiparissioti, John Migoulis, bought The Diner from Bill Panagos, whose wife Helen was my brother Bill's Nouna. John also actually remembers my Papou's oldest brother Ilias (Louis) as an old man here in Kyparissi. And as he lives in the Vrisi section of Kyparissi -- where the Sarris family had a mill and homestead -- and knows other people I mentioned. Unbelievable, I am freaking out! Winding our way along the highway to Sparti, where we change buses for Molaos before the last hairpin stretch to Kyparissi, Lakonias, where my Papou George Sarris was born. ‎My niece Rachel and friend Wendy are with me on a fact-finding, 5-day vacation stay in the beautiful, somewhat isolated seaside village. 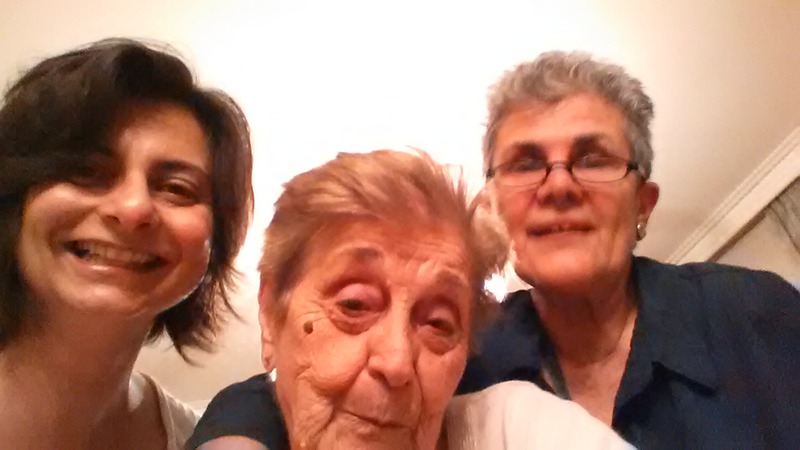 Last night we met up with my Aunt Soula Chrysopoulou, my father's first cousin from Naousa. 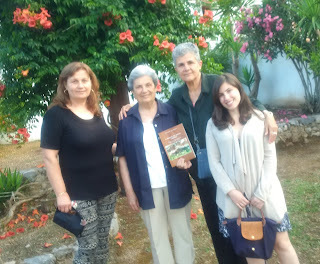 I wanted Rachel to meet her and her archaeologist niece Maria -- who actually took a vacation in Kyparissi a few years ago! -- just like we met Alkinoy Lala the night before. 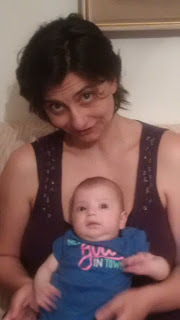 She is the daughter of my second cousin Manolis Lalas, whose family in Naousa I was close to when living in Thessaloniki way back then. Maria brought old pictures to dinner, ‎having gotten into the family history swing of things. She has a 3-month-old baby girl now to pass that heritage on to. Meanwhile, we wait for the proverbial political/economic shoe to drop. My aunt said that the outcome (or current status) would be announced today at 6:30 pm in Parliament. We will be watching from Kyparissi like everyone else -- witnesses to another critical slice of Greek history and hoping that Greeks get the break they deserve without further ado. To be continued, either way!